This is a funny story about Francis (Franny) Banks, a young lady, living in New York, with ambition of becoming a famous actress. She has set a goal of six months to accomplish her dreams. She is somewhat unsure of how she is to achieve her goal, but determined to do so. In case she fails, she can always marry her boyfriend in three years. Franny has some auditions, made a few commercials, but nothing that will make her an actress. She doesn’t even have an agent, but is hopeful of getting one soon. When she gets a call to audition for a bit part in a TV program she not only gets the part but an agent as well. Now, she thinks, I am really on my way. But, sadly, she is ignored by him and finally he dumps her. Now she doesn’t have an agent, no auditions or any chance of getting work. The six months have come and gone, but she isn’t worried. She will just set a new goal. Someday, Someday, Maybe she will be a famous actress or not. She isn’t too worried about the future. 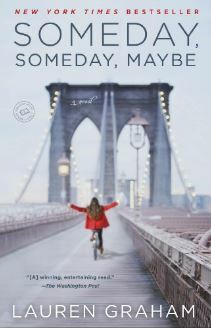 A very interesting read, full of hope, dreams and ambition of a young girl trying to make her dreams come true in New York. I liked it. Very entertaining.